It was already clear that Facebook was going to announce bots for its Messenger platform. So, it’s not a big surprise that Messenger rival, Telegram, released an update which reminds people that it had bots way before the competition. Telegram launched its own bot platform back in June 2015. The new update brings improved bots 2.0 to the rising messaging app. What are bots and what’s the fuss that currently surrounds them? Every big company is jumping on the bots bandwagon nowadays and it turns out there’s a good reason for that. The term bot refers to automated chatbots, which can be used within the familiar interface of a messaging app, but allow the users to interact with third-party apps or perform certain actions easily. Most importantly, all of this can be done without leaving the app or switching it. Users can search for a particular URL, ask about the weather, search for GIFs, get news etc. from within the messaging app (Telegram in this case). Users just need to call the bot and access its external services. They can be thought of as some alternate search mechanism that’s embedded into a messaging app, eliminating the need for users to perform external searches. So what do the Bots 2.0 hold for Telegram users? It brings new feature support, enabling more permissions for bots. 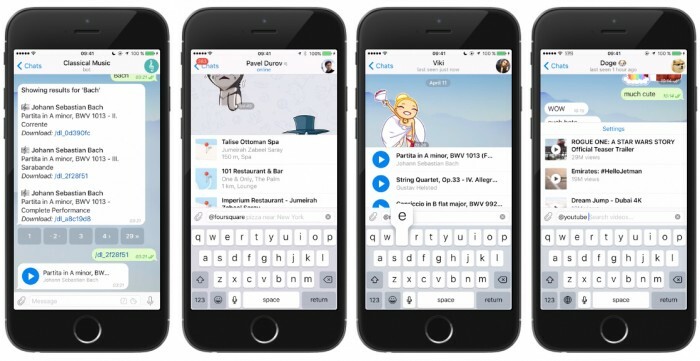 Developers can now build bots which can send any type of content on Telegram like documents, MP3s, videos, stickers, GIFs, contacts and more. Bots also get location service access, so they can integrate location information and provide services based on that. Bots can now use inline keyboards as well. These keyboards can be structured to mesh with certain bot messages so users can respond to bots via certain pre-selected buttons instead of typing text with their keyboard. Previously Telegram offered bots to use custom replies, like star ratings, but inline keyboards take things a step further. Buttons can make use of callbacks and URLs behind the scenes. Telegram update brings four new bots as well. They show off what the upgrade brings. There’s a @music bot, which can be used to search and share free music; @youtube bot for searching and sharing YouTube videos; @foursquare, a bot for finding nearby restaurants and sharing those; and a @sticker bot, which helps users finds alternate stickers and emoji by simply putting an emoji after tagging the bot in the text field. The messaging app, which recently reached 100 million user milestone, also brought a built-in video preview feature. The video player can play online videos like YouTube as well as offline videos. In addition to that, the UI received a minor makeover. Chat bubbles changed, process bars and buttons got redesigned and colors are now more optimized. Stickers are easier to find as well. Simply clicking on a new sticker brings the user to the complete sticker package and they can also be directly forwarded to other users without requiring any additional download. Apple users can get the app from the App Store while the updated app is also available on the Google Play Store for Android users.